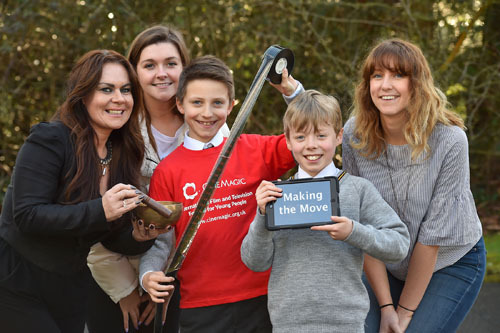 Cinemagic is delivering an innovative, ‘Making the Move’ project that uses the skills gained from film making, film reviewing and mindfulness to address and alleviate any fears Year 7 students may have about making the transition from primary to post primary education. Six schools across Belfast are taking part in the project. These include Malvern Primary School, Holy Cross Girls Primary School, Inchmarlo, Knockbreda Primary School, Seaview Primary School and Strandtown Primary School. Approximately 30 students will take part from each of the six schools. “Cinemagic loves the magic of film and television to educate, motivate and inspire young people. We strongly believe that the medium of film is a vital tool in personal and social development, stimulating discussion among young people about the world around them. The Making the Move project includes a two-day filmmaking workshop. Under the guidance of industry professionals the transition year students will use iPads to produce short films that express their feelings about the move. These short films will be screened at the end of the programme. Cinemagic will also host a Cinemagic jury session at each workshop. The students will watch and review films around the key themes of hopes, dreams and anxieties. Brenda Shankey, a specialist in children’s mindfulness, will host mindfulness workshops to teach the young people how best to cope with anxious feelings. This initiative is funded by the Department of Communities through Northern Ireland Screen.